I retired in 2013 from a 48-year career in newspapers. I started with the late Philadelphia Bulletin, eventually becoming a White House correspondent, then covered urban affairs and did investigative work for the Washington Post. My wife Penny and I moved to Montreal in 1973; its bi-cultural character matches my own French-English background. I was at the Montreal Gazette for 40 years as, successively, an investigative reporter, an editorial writer and a columnist specializing in issues affecting the city-region of Montreal. My work received three National Newspaper Awards and three National Business Writing Awards. 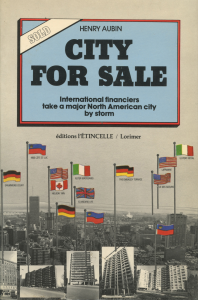 Two of my books are spin-offs of my Gazette work: City for Sale (a best-selling investigation of the often secretive interests behind a city’s redevelopment) and Who’s Afraid of Demergers? (a critique of forced municipal mergers in Quebec). One of my proudest moments as a journalist was co-founding the Centre for Investigative Journalism/Centre pour le journalisme d’enquête, the first pan-Canada journalists’ organization; three other reporters and I founded it in 1977, a time when the Canadian news media focused on press conferences and fluff; it helped spark a sea change toward more serious and enterprising work. (My role is described in Behind the Headlines: A History of Investigative Journalism in Canada, by Cecil Rosner, Oxford U. Press, 2008.) I have also been vice-president of the Fédération professionnelle des journalistes du Québec. Le Monde diplomatique: “A passionately interesting and extremely useful investigation with global ramifications.